It's the morning of NightBEAT 2015 at BB&T Field at Wake Forest, and before a step is taken or a note is sounded, I'm making a statement: It needs to come back. That's easy for me to say. I live in Greensboro, a mere half hour from Winston-Salem, but closer to an hour and a half from NightBEAT's usual Charlotte home - longer the years it was in Rock Hill. But my own biases aside, there are a few other reasons a show in Winston-Salem makes good sense. Location - Winston-Salem makes sense as a location both for what it's near and what it's not. While a move from Charlotte is a move away from the most populous city in the Carolinas, the trip is manageable for the five largest cities in NC - including Charlotte, and the three largest metros: Charlotte, the Triad, and the Triangle. Winston-Salem is closer than Charlotte to college bands at Appalachian State, Duke, UNC, NC State, ECU, and of course the host campus, Wake Forest. There's also a critical mass of band students right down the road at UNCG attending Summer Music Camp right up until the weekend of NightBEAT. And while it makes for a longer trip for the South Carolina schools and metros, they also have the Southeastern Regional in Atlanta within arm's reach. Stop being so greedy. 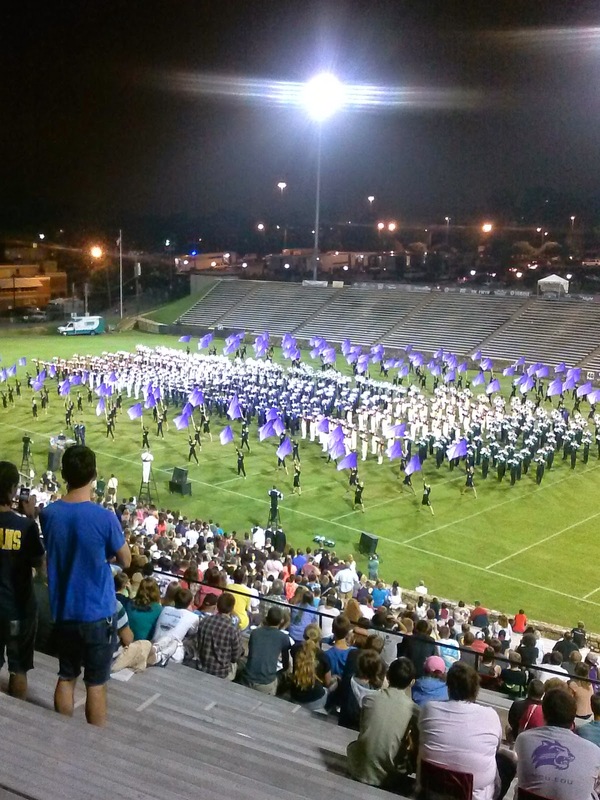 Hosts - While high school bands are key among drum corps attendees, most World Class marchers are college-aged and often college marching band members. Having a college band as a production partner makes good sense, and they have in Wake Forest and SOTOGAB something they've not had in Charlotte or Rock Hill. In Charlotte, a partnership may form with the brand new band at UNC Charlotte, but Wake Forest is already well established, and I've seen how their band and staff have shared in the effort of promoting NightBEAT. It's also in their house, which is not likely to be the case in Charlotte for UNC Charlotte, as I don't anticipate the show moving to Jerry Richardson Stadium from American Legion Memorial. Wake Forest's conference affiliation also means there's a well-worn path from UNC, NC State, Duke, Clemson, and Virginia Tech. By no means am I suggesting Carolina Crown abandon Charlotte. The corps was founded there, and still calls the metro area home. 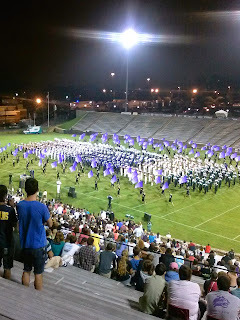 For a corps that bears the name "Carolina" - neither north nor south - a centrally located show makes sense. But if NightBEAT sees fit to rotate, Winston-Salem makes as much sense as anywhere. For that matter, if Crown returns to an early season show as it once had in FirstBEAT and CrownBEAT, Wake Forest as a location is a no-brainer. Here's hoping they feel that way after the experience up to and including today. DCI returns to the Triad for the first time in over a decade today. Here's hoping it doesn't take that long for a return engagement.